Author(s) Smith, S. A.; Smith, S. A. 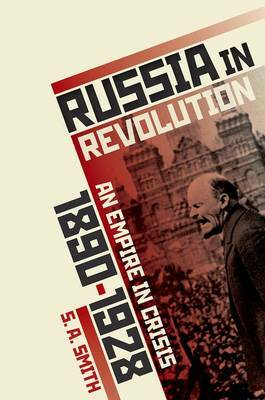 The Russian Revolution of 1917 transformed the face of the Russian empire, politically, economically, socially, and culturally, and also profoundly affected the course of world history for the rest of the twentieth century. Now, to mark the centenary of this epochal event, historian Steve Smith presents a panoramic account of the history of the Russian empire, from the last years of the nineteenth century, through the First World War and the revolutions of 1917 and the establishment of the Bolshevik regime, to the end of the 1920s, when Stalin simultaneously unleashed violent collectivization of agriculture and crash industrialization upon Russian society. Drawing on recent archivally-based scholarship, Russia in Revolution pays particular attention to the varying impact of the Revolution on the various groups that made up society: peasants, workers, non-Russian nationalities, the army, women and the family, young people, and the Church. In doing so, it provides a fresh way into the big, perennial questions about the Revolution and its consequences: why did the attempt by the tsarist government to implement political reform after the 1905 Revolution fail; why did the First World War bring about the collapse of the tsarist system; why did the attempt to create a democratic system after the February Revolution of 1917 not get off the ground; why did the Bolsheviks succeed in seizing and holding on to power; why did they come out victorious from a punishing civil war; why did the New Economic Policy they introduced in 1921 fail; and why did Stalin come out on top in the power struggle inside the Bolshevik party after Lenin's death in 1924. A final chapter then reflects on the larger significance of 1917 for the history of the twentieth century - and, for all its terrible flaws, what the promise of the Revolution might mean for us today.